Practicing my Space Shuttle landing skills., originally uploaded by Dave Schumaker. You can check out the above space shuttle simulator on your iPad, iPhone, or iPod by downloading F-SIM Space Shuttle from the App Store. This is pretty fantastic! Eric Jacqmain built a “solar death ray” using 5,800 mirrors glued to a satellite dish. The R5800 is my latest and greatest solar creation. Made from an ordinary fiberglass satellite dish, it is covered in about 5800 3/8″ (~1cm) mirror tiles. When properly aligned, it can generate a spot the size of a dime with an intensity of 5000 suns! This amount of power is more than enough to melt steel, vaporize aluminum, boil concrete, turn dirt into lava, and obliterate any organic material in an instant. It stands at 5’9″ and is 42″ across. Seeing kids and young adults do science experiments and create things like this gives me hope for our future! Back in March of 2010, I wrote a post looking at the frequency of earthquakes occurring around the world and examined whether or not there were more earthquakes occuring than normal. Specifically, I chose to look at earthquakes between M6.0 and M6.9, as they are sufficiently large enough to be detected by seismometers around the world and they seem to be well documented in recent history. So, what were the final numbers for 2010? Using the global earthquake search tool on the USGS website, we can see that there were 151 M6.0 – M6.9 earthquakes detected last year. According to recent USGS data, an average of ~134 earthquakes happen in this range every year. Yes, we had 151, but does that mean it’s time to freak out? It falls well within what we would expect. In fact, there were more earthquakes within this magnitude range in 2007 (178) and 2008 (178)! What? Crazy! So, to sum things up, the world is not ending, despite what crazy folks say, earthquakes are not increasing, and there’s probably a number of other things more important to worry about. The annual American Geophysical Union conference is in town this week and I’ve been fielding a bunch of questions about the strange creatures (known as earth scientists) that are inhabiting downtown San Francisco. I’ve probably mentioned this before, but Uncyclopedia nails the description of a geologist. 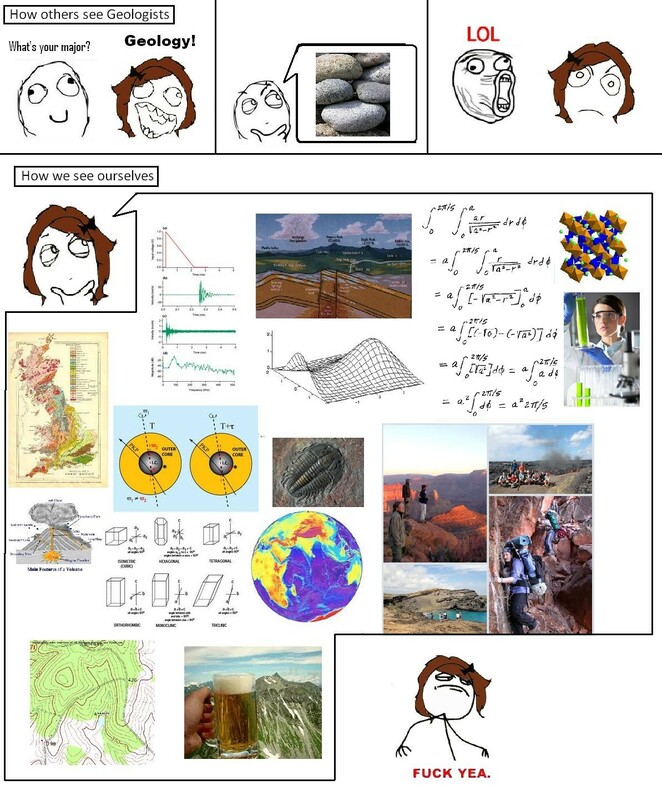 Geologists are ‘scientists’ with unnatural obsessions with beer and rocks. Often too intelligent to do monotonous sciences like biology, chemistry, or physics, geologists devote their time to mud-worrying, volcano poking, fault finding, bouldering, dust-collecting, and high-risk colouring. One of the main difficulties in communicating with geologists is their belief that a million years is a short amount of time and their heads are harder than rocks. Consequently, such abstract concepts as “Tuesday Morning” and Lunchtime are completely beyond their comprehension. The section on alcohol consumption is pretty amusing (and somewhat apt) as well. If you ever encounter a geologist who is sober after 6pm, this person is an imposter: possibly an alien; probably a geophysicist or engineer, marine geographer or hydrologist etc. Alcoholism is an acceptable, even socially beneficial, disease for an active geologist. The whole article is a fun read though, especially if you are or know any geologists. First evidence of other universes? This stuff is so trippy to think about. So, what to make of these discoveries. First, these effects could easily be a trick of the eye. As Feeney and co acknowledge: “it is rather easy to fifind all sorts of statistically unlikely properties in a large dataset like the CMB.” That’s for sure! Apparently, I’m on a physics kick as of late.